I’ve been told that I “understand” toddlers (and nothing could be a greater compliment). This might be because my own emotional development was partially arrested as a toddler for reasons I haven’t yet unraveled, but it’s probably also because after all the time I’ve spent observing toddlers, I’ve begun to identify with them. Sometimes, for example, when a parent in one of my classes asks her toddler not to throw toys, I’ll be unconvinced by her delivery and feel like joining the toddler in throwing more toys. Other times, a child will say he wants to leave the class as soon as he’s arrived. He’ll persist with the issue until his parent says decisively, “I hear you wanting to leave, but we won’t be going until class ends.” I’ll be feeling the toddler’s edginess while the parent is thinking, “Uh, oh, now what?” or is afraid to take a stand. 1. Make me your ally. Don’t think in terms of “getting me to do” something. Don’t trick, bribe, shame or punish me. “You against me” is scary when I desperately need you on my side. So, please tell me politely or show me what you want. And stop me kindly (but definitively) from doing things you don’t want, way before you get mad. Your calm demeanor and the positive options you give me (“I see you’re playing, so would you like to come in to change your diaper now or after you play for 5 more minutes?”), will help me to accept your instructions more gracefully. 2. Don’t be afraid of my reactions to the limits you give me. It’s discomforting for me when you are timid, tentative or evasive. How can I ever feel secure if the people I desperately need to depend on waver or tiptoe around my feelings? So, please put periods at the end of your sentences and then calmly accept my displeasure. Your directions are more welcome than you’ll ever know. They don’t hurt my fragile spirit. They free me, help me enormously, and are essential to my happiness. 4. Don’t get upset or angry if you can possibly help it. Those reactions don’t make me feel safe. I need to know that my behavior doesn’t “get” to you, that you can handle my issues with care and confidence. If not you, then who? 5. If I keep repeating the behavior, it’s because it doesn’t feel resolved for me. Either you aren’t being convincing enough, or you’re being too intense and emotional. When you give me “the look”, or there’s anger in your voice when you say “don’t hit!,” it unnerves me and I’m compelled to keep behaving that way until you can give me a calmer response. I need to know that those kinds of behaviors aren’t allowed, but I also need to be assured constantly that they are no big deal at all and can be easily handled by you. You’ll show me this by being patient, calm, consistent and giving me brief, respectful, direct responses so that we can both let go and move on, knowing that our connection is still solid. 6. Consider my point of view and acknowledge it as much as possible…even if it seems ridiculous, wrong or crazy. There are no wrong desires or feelings, just wrong ways of acting on them, right? I need to know that it’s okay to have these feelings and that you’ll understand and keep on loving me. Let me feel. 7. Remember that I don’t want to be in charge, even though the toddler creed is to never admit that. I am convincing. I can make you believe that your simple request to sit down while I eat is pure torture. Don’t mock me or call me out, but don’t believe it. Keep insisting — with love. My strong will is going to make you proud someday. When you give in all the time, I feel less strong, far more wobbly. 8. Give me lots of YES time when I have your full attention and appreciation for all the good stuff I do. We all need balance. 10. Thank you for doing all of these really, really hard things in order to help me be the kind of kid who is enjoyed by his friends, is welcome in their parents’ homes, appreciated by teachers, and is (most of all) one of your favorite people to be with in the whole wide world…forever. I just gave someone your info on the playground today!! read this article 5 seconds later and here you are!!! Hope to see you soon? camp training? Love! Love! Love! I really need this at the moment, it is so easy to forget that they ‘don’t want to be in charge’. Trying to see things from my toddler’s point of view is a really big part of parenting to me. I’ll be sharing this with all my friends. p.s. I just found your blog a couple of months ago and it is one of the few I read regularly, so much food for thought! Thanks for sharing your ideas. Most welcome, Tessa. Thank you for reading! This is a beautifuly written article. I have this on my fridge to remind me what my son is telling me. Thank you. My first time reading your blog, and I nice article to be introduced on. Great advice. #5 really resonated for me because most of the time I don’t have to haggle with my son. The times that I do, it’s most certainly because I’m unnerved and he’s picked up on that. Thanks for reminding us to see it from their point of view! oh. wow. This is quite possibly the best blog post I have ever read. Thank you so much. I feel like everything I think, feel and try to achieve with my sons is set out in front of me on the screen. Written so much more concisely and eloquently than I could hope to achieve. Thank you for writing this. I can now pass it on and say “There!! This is why I do and say the things that I do”. I guess I am old school. I agree with the basic principles here, but spanking definitely needs to be a part of discipline. Especially in regards to #5. I basically only spank for direct disobedience, blatant disrespect for me or my wife, and lying. I’d much rather have my child suffer a spanking now and learn that bad choices means bad consequences. Then to have them become an adult never having learned that. Also, spankings are rare in our home. We have four kids and we were/are always able to go out to restaurants or movies or wherever. I can’t even count how many times I have had strangers come up to us and compliment us on how well behaved our children are. Another area that parents struggle with is eating and sleeping. My only suggestion there is, DO NOT NEGOTIATE. One meal for everyone. If they don’t eat it, they don’t eat. Their stomach will get the message pretty quick. Bedtime is bedtime, DO NOT NEGOTIATE. My basic principle in parenting is “you get whatever you are willing to put up with” If you establish boundaries early and have real consequences for breaking the boundaries, your child will learn the rules quick and be happy knowing what is expected of them. I’d like to knock some sense into you. Interesting, you threaten me with bodily harm. You’d think someone who is against spanking would also be against assault and battery. I am only saying that spanking be a choice of last resort. When you need your kids to listen to you, like when their lives depend on it, you better have instilled respect in them or you might get to witness a tragedy. For example, if your kids laugh and run away from you when you call them, what will you do when they run into traffic? As I said in my previous post, spankings are rare in our house, because we established very early on what was acceptable behaviour. The fallacy among most parents is that spankings will have to be done daily, when in fact you might only have to do it once. Rob, you don’t get your children to respect you out of fear for you – you instil respect when you SHOW respect, for them and for the people around you. If you do this from the beginning they WILL listen when you need them to. Fear does not equate to respect, it equates to obedience out of fear for the consequences YOU impose. War, Genocide and bullying all rely on unwavering obedience to gain and keep momentum. I like that my children feel safe in questioning everything they are asked to do. I hope they will carry that into their teen years. I know that by then we will have mutual respect so that when I need them to understand and listen they will do so, and I hope that by then I will have taught them self-discipline and the ability to think clearly before making a decision. This will serve them much better than obedience to the biggest or strongest person around them. You do not have to hit even once. Parent with love, parent with respect and it will simply not be necessary. ever. War, Genocide and Bullying all rely on unwavering obedience to gain and keep momentum? Well, so does marriage, shouldn’t spouses have unwavering obedience to their vows and each other? You must think I run a dictatorship. Again, I am talking about structured spanking, not hauling off and hitting a child in anger, that is always wrong and just stupid and evil. Of course my kids can ask why they have to do something. I simply tell them that as a family we are a team, we all pitch in together. Hi Rob. I strongly disagree about the necessity for spanking and I especially hope you aren’t doing this to your toddlers. Toddlers simply aren’t capable of controlling many of their impulses and discipline at this stage, especially, is all about relationship building. Hurting, shaming, tricking or otherwise manipulating children erodes our relationship because trust is lost. Children disrespect parents because they have felt disrespected. Children lie because they are afraid of telling the truth. If they are not afraid of our responses, they have no reason to lie. Interestingly, the one and only time I’ve had to give a “consequence” to any of my children (grounding my eldest teenager when she went to a party she wouldn’t have been allowed her to go to), she actually sort of welcomed it, because it felt completely fair to her and she knew it came out of tremendous care and love. Spanking, hurting or torturing is never perceived by the child as a loving response. Never. Those things only create resentment and fear and deplete self-worth. Yes, I believe our perception about spanking can change once we become an adult. Most of us want and need to think well of our parents. We’re forgiving and feel on a very deep level deserving of the way we were treated. So, we might see their spankings as fair and loving, but the toddler does not… I can guarantee that. Rob, you seem like an intelligent, caring dad, so I’d like to ask you the question that always comes up for me when parents believe in spanking… If you knew for certain (as I do) that you could raise kind, polite, safe and successful children without ever hitting them, would you still do it? Why? I didn’t know your thoughts on spanking until I after I posted my original reply. I guess we have to respectfully disagree. You say toddlers can’t control themselves but in the next breath you say they are testing boundaries, so which is it? If they are testing boundaries then they must have some idea that they exist or should exist. I’d throw out my blatant disrespect comment because, honestly, I don’t remember ever spanking for that. Remember, we are talking about spankings that could be counted on two hands spread over 4 children. Also, I abhor anyone that spanks a child for an accident. I am advocating a structured spanking where the parent is in control of their emotions and explains to the child why they are getting spanked. You also state that children lie when they are afraid to tell the truth. Again, I disagree, have you not seen the multiple videos on America’s Funniest Home videos of toddlers with chocolate all over their faces while their moms ask them if they ate the chocolate? The kids just keep denying the obvious, even when the mom is laughing at the shear audacity of their lies. Clearly, the kid is not scared. Lying is innate. Nobody teaches their kid to lie, it comes naturally to them. Also, I would say your daughter lied to you by omission. She knew if she told you the true nature of the party you would not allow her to go. Also, I would add that I don’t believe in spanking teenagers. You are onto something when you mention that your kids know when they deserve punishment, I believe it is the same with spanking. They know what’s fair. Given the ground rules I have for how to administer a spanking, why do you conflate it with torture? Nobody would advocate that. Finally, you say I seem like an intelligent caring dad, thanks, you seem intelligent and caring also. I think your question is a bit silly, nobody knows the future and you don’t know either, you know what worked for you. That’s like people who ask, if you could get away wih murder would you do it. Getting away with it doen’t absolve the act. I believe spanking instills a strong sense of right and wrong and the dangers of bad choices and their consequences. I’d rather my toddler get a swat now versus a prison sentence later. Rob, I’m disappointed that you couldn’t answer my simple question. I’m also sorry that you actually believe a parent must choose between “swatting” and prison. Rob, 84% of prison inmates have been abused as children. Where do you get this bizarre impression that not hitting a child leads to criminal behavior? Please show your statistics. That is a preposterous and sadly misguided theory. There are statistics about hitting out of anger vs. the cold, calculated type that you believe in… Guess which one children are more likely to understand? Sorry to disappoint you Janet, but your question is based on an impossible supposition, ie knowing the future. So, forgetting the laws of the physical universe for a moment, I will answer, no, I would not spank my kids if I KNEW they would come out alright. That doesn’t change anything in reality though. Again you conflate spanking with abuse, I guess you think they are one and the same. So you think striking a child in anger is better then taking the time to talk to them and explain why they are getting spanked? Again, you agree with me that children know when they are being punished justly. If they know what they did wrong, they will understand the punishment. Hitting them in anger is never right and counter productive. I DO, however, believe that solid discipline (both positive and negative consequences, along with solid teaching to the child) leads to helping kids understand that actions have consequences, thus helping them avoid the pitfalls of bad decisions that could lead them to prison. Like I said, I didn’t know you were anti-spanking before I posted. Although, again, I must remind you of your own words, kids know when they are being punished justly. So a toddler who is deliberately going out onto the street or playing with the knobs on the cooktop after being told not to, knows they are being disobedient. Also, I don’t think the toddler’s perspective should trump the parent’s authority. It can inform the parent’s actions, but ultimately the parent has to do what they believe is best for the child, not what the child thinks is best. I appreciate that you post my comments even though we are detrimentally opposed on spanking, it says a lot about your integrity and the strength of your beliefs. Rob, it’s not about knowing the future, it’s a different belief system and that’s one of the big differences between you and me. You believe physical punishment is necessary and I’m certain that it isn’t. I believe that hitting a child is abusive, period. 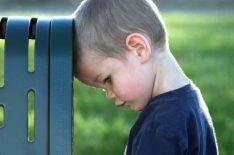 Children can’t categorize pain… All they know that their parents are hurting them. Perhaps they learn to believe themselves deserving, but that is sad, in my opinion. Rob, I grew up in a home where the views you present were utilized. So did my husband. Both of us love our parents. But…neither of us feel spankings are a positive or necessary means of discipline. In all actuality we both feel they can border on abusive, especially depending on how they are carried out. Neither of us have ever, or would ever hit or otherwise utilize corporal punishment with our children. Being a parent is not easy, as obviously you know, since you have four! As a parent, you have a size advantage. You are bigger, stronger, and that in itself instills fear. We all teach our kids that hitting is wrong, yet using a form of “hitting” to teach them to control themselves and do right, seems totally counterproductive. Most of the time you will see kids responding to you, the way you respond to them. They are huge imitators. If you show them respect and love, they respond in kind. For more dangerous actions, it’s important to be very watchful, such as your example of a toddler running out in the road. Most toddlers don’t really have an awareness of why this is dangerous, which is the reason adults must keep them in the house, fence the yard, hold their hand, until they can understand not to run into the street. Lots of methods can be utilized to help them see this isn’t safe, as they get old enough to understand these concepts. I do think at times there have to be consequences for more serious and repeated actions, but I think natural consequences make a lot more sense. Think about what happens as you grow older? You don’t do your homework and you get a bad grade. You come late to a practice and your coach won’t let you play in part of the next game. You don’t perform well at work and you get a bad rating, don’t get a bonus, eventually may lose your job. The list goes on and on. Inflicting actual physical pain on someone else? Doing that, sends you to jail. Teaching our kids by doing that? I would think our amazing imitators, might just do the same. Hi Rob, I’ve been reading the passionate blog about spanking and finally had to share some thoughts. I’m the mother of 3 grown children and now a grandmother. I did not believe in spanking when raising my three children. I share that just to let you know some background. You said that you wouldn’t spank a teen? I’ve heard this many times before. Why not? Probably the same reason you wouldn’t “spank” your wife, or a neighbor. Here are some of the reasons I’ve heard in the past to rationalize this thinkig: It’s wrong to hit a person, they’re too big – could hit you back (I’ve also heard this a lot), it’s disrespectful… are there other reasons? This is where I find a huge disconnect. Why do we treat young children with any less dignity and respect? What sense does that make? If your 3 year old hits her little brother – do you tell her not to hit? That it’s not nice? That it’s wrong? How do you expect your children to reconcile that? Will your children turn out okay? Probably. It sounds like you and your wife parent with a lot of intention – that it matters. But I’m telling you…you can get these beautiful children who depend on you for their very existence, to adulthood without spanking them to punish them. They deserve guidance and to learn cause and effect. The youngest and most vulnerable do not deserve to be hit. Just give it a try. If you can calmly, like you say without emotion, explain to a child why you are about to hurt them and then go ahead and hurt them repeatedly, there is something wrong with you! Something missing from your soul. For more education on this, please know that the part of the brain that controls impulses doesn’t fully mature until into a person’s mid 20’s. So no, a child running into the street or touching a hot stove doesn’t know they’re being disobedient. Their memory recollection is insanely short. Repetition and positive reinforcement are key. I say this as a mom of a very active recently diagnosed with autism toddler boy. He’s run into the street when we’ve told him no. My husband and I were both raised by parents who hit us. I will never call it spanking. We were hit, abusively, for any minor infraction. The fact that we don’t hit our son frustrates family members. When you hit, you break trust and institute a power struggle. Why? Because you show your kids that the only power you have is with your hands. You’ve lost control. My mom only stopped with us when I grabbed her hands when I was a teen and told her to stop hitting me and my brother. We were both bigger than her and the dynamic didn’t work anymore. That was the only card in her deck. She didn’t know how to parent without beating. When that’s your fall back, you’ve lost control. And no one is allowed to touch my son that way. I’d never hit back. They would just be not welcome around my family. Your approach is one where you USE POWER over the child to coerce the child to meet your needs. This is the fundamental principle of all Hierachical Systems. As for eating, in nature food is abundant and freely available, and in the old societies, people ate, slept and were active at different times, even within a family group. It’s important to recognise that our biology is emergent from within nature, even as we are faced with the pressures of Hierarchical Society to confrom to patterns that are predicated by the ‘demands’ of the ‘economy’. To withold food when a child is hungry, to demand that the child eats only when you do, is quite rude! I hope you can see that whilst noting that I DO understand the limitations of parenting within the current systemic patterns, and that you can find a way to bridge both that is healthful, fun and nurturing. Our fridge was always ‘open’, bowls of fruit were there to be picked from as needed, and I rarely bought processed foods, chocolates, candies etc and my children did not suffer from this. Neither did I. We are biologically mandated towards natural empathy, based on self empathy. Note that the generation gap, the tantrum toddler, the teen rebellion are extremely rare in healthy aboriginal societies and absolutley non-extant in all other mammals. What’s your doctorate in? Show me a parent who doesn’t guide their children towards best practices. Any influence a parent has over a child is born from power. Ask a toddler what they want for dinner, if they said candy would that be all you fed them, or would you exert your heirarchal power to guide them towards something healthier with just a piece of candy for dessert? Parenting is really a benevolent dictatorship, whether anyone wants to admit it or not. Even you admit that you don’t buy processed foods or chocolate or candy, who gave you that right? You are a benevolent dictator, the children in your house live under your dietary prescriptions. I’m surprised that you would cast off the communal aspect of eating as a family and sharing all the experiences of the day together. Sharing in a common meal is foundational to the communal family experience and staying in touch with how your kids are doing. That being said, I think family meals should be a time of togetherness and the meal should be the same for everyone. Show me an aboriginal society where seperate meals are prepared for picky eaters. Also, your contention that food in nature is abundant and freely available might come as a surprise to Ethiopians or Kenyans suffering through one of their worst droughts ever. The “freely” might surprise your local Whole Foods store owner as well. Thank you for your comments. I agree with all of them 100%. I keep coming back to re-read this post. You really do understand toddlers, Janet! I so love working with toddlers for the very reason many people want to avoid them or struggle with them- what you see is what you get- there’s no artifice, and their behavior is often a reflection of how well we are communicating with them. Toddlers have taught me so much about the importance of honest, direct and respectful communication. I especially appreciate “don’t think in terms of getting me to do something.” The nest way to ensure you will get nothing but resistance from a toddler is to try to “get them” to do something. Getting someone to do something you want them to is about “power over” and is an insult to the other person (and toddlers are little people), to the relationship, and it erodes the trust between adult and child. It’s amazing how well toddlers respond to direct, simple requests, made in a calm way. 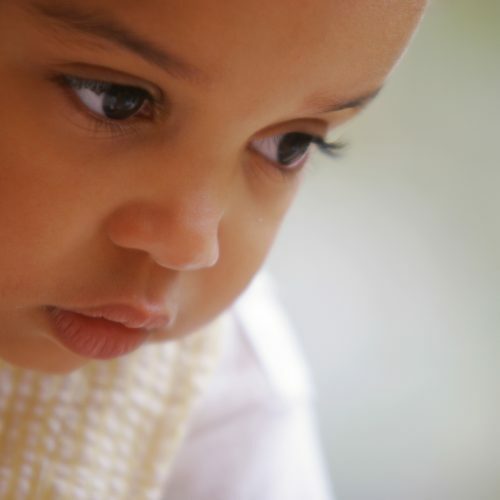 Often, I find if a toddler is resisting, I need to check in with myself, and see if I am being slightly manipulative, indirect, or demanding in my approach, because if I am, it’s most likely that’s where the difficulty is… Aren’t we lucky that toddlers are so patient with us, and give us so many chances to get it right in our relationship with them? Oops- That would be, “The best way to ensure…” I guess I should remember to pop in contact lenses before typing comments! So true! Looking back at the most difficult moments or situations it has been my fault and my way of trying to make him do something which caused him to resist so much. I am so thankful that he continues to give me chances as I learn to be flexible and be who he needs me to be. This is such a fantastic post – my work is with preschoolers, but I interact with the toddlers in our center on a daily basis. And some of the preschoolers need all of these things that you describe. I have been doing work in my classroom on Developmental Discipline – and everything you’re saying really strikes a chord with me. Thanks so much! The YES really works! Read that in Betsy Braun book “just tell me what to say” and have been practising the YES,yes, yeesss! Thank you for this. It’s beautifully written. I had an experience with my toddler where I honored many of the things you’ve listed. I appreciate this article’s clarity. Thank you, Min Yi Su. I love your story, have shared it on my FB page and everyone is enjoying it! Phenomenal article! It can be so hard as a parent to realize that the issues you may have with your child’s discipline come from you. My wife is my inspiration for parenting as I aspire to embody her interactive nature with our son…I don’t want to just be “Dad the Enforcer” and “Dad the Jungle Gym.” I want to be “Dad.” That means inspiring my son, learning his want/needs, teaching him to be part of a family dynamic, rewarding his good behavior, and appropriately conveying my feelings as well. Parenting is a sacrifice no matter how you look at it, you are making yourself into a person that another person completely relies on…100%. The reward is teaching that person to rely on themselves and witnessing the evolution of a personality over a lifetime. I love what you have written here about discipline from the perspective of a toddler. So spot on! My biggest goal with my 1-year-old son is for him to grow up in a house where his voice will be heard, his feelings will be respected, and family comes first. Sounds simple…but it is (as I write about on my own blog) a challenge. I love this post, but I struggle with some things. 1. How to handle repeated requests that I sincerely don’t understand or can’t figure out what is being asked (or which switches–‘I want that toy’, I hand it to him, then ‘NO, I DON’T WANT IT!!!!! !’, etc. 2. Public displays: I can handle allowing the full range of emotional displays in our home where it’s safe, but when it either gets out of control or hurts another child or is manipulating/controlling the family’s participation/commitment. 3. Blocking a Parent’s Commitment to something: My wife has a weekly commitment with childcare. One of our 3 yr old twins creates mayhem. Does she stop the commitment? When your child says he wants a toy, just acknowledge, “Oh, you’re wanting that?” I wouldn’t simply hand it to him… I would do as little as possible in order to give him the opportunity to get it himself. Then you can be sure that’s what he wants. 2. This might be hard when the whole family’s together, but generally, I would go with the child either home or to a more private place (like the car) so that the child has a chance to get the feelings out safely and privately and can eventually calm down. 3. No, the 3 year old shouldn’t ever stop the commitment! But it’s perfectly okay for her to disagree with her mom leaving. Let her holler and cry while you acknowledge, “I know you don’t want mom to go, but she’s working today” (or whatever). Sometimes a few minutes of one-on-one time with mom earlier that day can prevent the meltdown from happening…sometimes not. Focus on supporting her to have her feelings. Thanks for the great reply! I know these methods are like anything else: You can’t just give it a shot one time and hope it works. It has to be consistent. You’re so welcome, Brett. And yes, consistency matters. That’s the way we build confidence and project it for our children. These aren’t things most of us are born knowing! Update… we’ve been trying to implement some of the strategies indicated in this post. We have been attempting to be firm, gentle, unapologetic, non-threatening and non-bargaining, laying out our expectations and firmly telling our young (3 1/2) boys what is expected. For example, going potty and brushing teeth at night. So far, our results are infinitely long sit-ins where we firmly repeat what is required. Secondly, my wife and her Bible study. one of the boys cries and fits throughout the time in childcare, so my wife has given up. I don’t know if it’s something else, but we’re struggling with knowing how to navigate these waters. It’s leading to major frustration–but we’re trying not to show it! It’s not enough to convey your expectations, you and your wife have to follow through… So, assuming your boys are able to use the potty independently, say, “It’s time to go potty. Who’s going to go first?” Projecting confidence (envisioning your children totally capable of cooperating) is 90% of the battle. Toddlers need this balance of the security of boundaries and autonomy. It’s sometimes hard to find the right groove, but you will. Don’t be afraid to insist. You can do that and still be gentle and respectful. As far as the bible study, I didn’t know that was a situation in which the boys went with your wife. Do they have to? It’s hard for me to comment on the childcare when I don’t know what goes on there… But perhaps your wife isn’t projecting confidence about her plans… I don’t know, Brett! Let’s keep talking. Hi Brett, I have 2 boys that are very much speech delayed. My younger son is 3 and hardly talks at all but when my older son was 3 or 4 he was talking at about a 2 or 3 year old level, he had the understanding of what he wanted to say and the vocabulary, just not the ability to get his brain and mouth to work together. When I wasn’t able to understand what he was saying I would ask him to describe it to me and ask questions on what it looks like. (Is it food? A toy? What color? -only ask this if he absolutely always knows his colors or it only adds to the confusion. Is it big?). I was always amazed at how well he was able to find a definition for complex thoughts. I’m looking forward to the day when my younger son is able to talk well enough to get his thoughts out somehow. I have been in more physical altercations than most of course that I’m not proud of. You might think I would agree that spanking your children serves a purpose. My view is quite the opposite and with a 9 year old and a 1 1/2 year old I can proudly say that I have not spanked or hit either one of them once. They are great kids and I learned almost immedietely that there are other ways to establish a respectful well mannered child than hitting them. Kids are like sponges and will more often than not, mirror an adults actions. Just because you are bigger and think you understand more than a child, doesn’t give you the right to hit them. I challenge you to actually sit down and talk to them about their actions and if they are too young to talk, than be patient and show them. Hitting them shows them nothing but showing them that it’s ok to physically hurt someone if they don’t listen to you!! I have two new responses that might cover what you mention. I would disagree with your last statement. I reference my rules of spanking from previous posts. A child will understand when they are receiving “just” punishment. Even Janet agrees with me on that. Spanking does not create a license for a child to go around whacking people. If this were true, why have I never had an instance of any of my kids getting in trouble for aggression at school or anywhere else? They know it is not their place to discipline kids their own age. In fact you could even argue that a kid who has never been spanked wouldn’t understand that hitting other kids hurts them. One of my children was a biter and we couldn’t get her to stop. I called my Mom (who is the greatest) and asked her what to do. She said, “bite them”, I said you’re kidding, she said, they won’t stop biting until they understand that biting hurts. I did it and our daughter never bit another person. What do your children learn when you spank them? I know that they learn *not* to do something, but what do they learn to do instead? My thought is that children who are spanked learn that if they do something wrong, they will get hurt. They are therefore not acting on the choices they perceive, they are thinking ‘which one won’t get me a spanking?’. They are less likely to take risks. They are also learning that it is okay for someone who is bigger to hurt someone who is smaller, as long as the bigger person thinks they are right and the smaller person is wrong. I don’t agree that “a kid who has never been spanked wouldn’t understand that hitting other kids hurts them’. In fact, as Janet pointed out earlier, there is more evidence that children who have been hurt in the past grow up to hurt others themselves. This is true in the playground as well: children that are hit are more likely to hit others. Please forgive any misspellings or use of the wrong word, my tablet loves auto correcting and I don’t always catch it especially lately since my teething baby make me sleep deprived. First I just have to say how stressful it is how people these days yell “child abuse!” Over little to nothing these days. Pfft it’s like they live in a dreamland and don’t really know what it is. It’s ridiculous. I grew up in a home with both: spanking like yours (my mother) and actual abuse (my father). My mom rarely laid a hand on us and she took care to not actually hurt us, it was just a small stinging from her hand. This was only done when we just absolutely disobeyed. And I DID know it was well deserved at a very young age. I knew my mother loved me, that the spanking was a way to basically get my attention when absolutely nothing else worked. My father on the other hand, HE was abusive and I knew there was no love behind his actions, just rage. It would range from a severe spanking to an actual beating where I would be left crumbled and bleeding on the floor next to my mom who would always try to protect me and get the worst of it. I was a punching bag along with my mom. I got to experience what both types of spankings are like and these people are so wrong, they are NOT the same. Eventually, my mom escaped my dad’s clutches. I’m 28 now and I can count how many times she’s spanked me on both hands. Of course the abuse caused some major issues for my at various levels. I too was abusive and filled with rage which made me lash out at others. We could barely afford food,much less a counselor and my rage started to destroy me like a wild fire. My mom was the one to bring me back to my senses when I was out of control. Eventually I found art had a calming effect on me. With art and the help of my mom who always brought me back from the edge I was able to grow up into a decent person. Today I have a loving husband and an 8 month old, who I don’t think I will be spanking. Not because I’m against it, but because I’m not curtain that I can be gentle about it like my mom was, I’m terrified of being like my father even tho I’m in pretty good control of my emotions I don’t want to risk it.I want to discipline my daughter, not abuse her. Also I agree with letting kids go without dinner if they don’t eat when told. One of the ladies here boasted about having an open fridge with fruits and stuff, well not all families have the luxury of a meal everyday, so kids should learn to be thankful and appreciate when their parents set food in front of them. The central skill in parenting is empathy, and empathy for others is founded on self empathy. No instruction set can replace the precision with which empathy and self empathy work. When a parent understands how his or her own childhood experiences have affected, distorted or nurtured self empathy, they can then RELATE to the child before them, based on embodied knowledge, the truth of experience over conditioned responses to experience. I love this article, Janet. As my oldest is growing out of his toddler years and into a pre-schooler, I’m so thankful I found your blog. He is kind, polite, thoughtful, and loving, and quickly outgrowing the impulsive defiance that comes with toddlerhood. We enjoy each other’s company so much, and I’m so proud of how self-motivated he is to share and show kindness to others. Just today I was thinking about how fortunate I am — both boys told me they were ready to leave the park because they were tired, and then we had dinner, got baths, watched a little tv together, and then went to bed without any fussing or fights. It was amazing, and I want you to know that your wisdom is giving my children the gift of a happy, loving childhood. I’m marrying a man with an idetic memory. He clearly remembers what it’s like to be a toddler, and he would tell you that this is NOT IT. This is overly-emotional nonsense. Everyone knows that our crime rates today are tremendously higher than they were 100 years ago. 100 years ago, spanking was Standard Parenting 101. Today, spanking is RARE, but our prisons are overflowing. Child psychology nuts have dominated the parenting arena for decades, and I don’t think it’s helping anyone. I’d also like to see even one study linking crime to children who have not been hurt by their parents. This is SUCH a ridiculous, narrow minded, fear-based and totally false idea. If you don’t think toddlers are emotional then you obviously haven’t spent 10 minutes with one. They have conflicting emotions and little verbal language to express themselves. Staying calm or taking a deep breath when I start to feel my own feelings spiraling has helped me immensly in keeping my cool and working through my son’s emotions. Children need love and support, not constant punishment. I printed this post out and have it on our bulitten board. My mom read it and loved it. She just kept saying “yes yes yes” as she read it. She raised 3 kids without hitting us. Thanks, Jen. I love your mom! Not every child is your husband. Spanking is not rare. Google “u.s. the spanking statistics” the number is over half for sure. There are more people today to fill a prison. Prisons today are a money making scheme. The more people you throw in the more tax payers money you get to take out for housing them. Prisons take advantage of the low income, stressed out, minorities who have a history of being bullied by whites. I think we are all aware that prisons are 70% comprised of non- whites. I’ve even read that these non-whites are rated highest for spanking in other articles I’ve read. well, maybe everyone you know is sure of that, but the people who track these things say something very different. Crime has been going down for almost 30 years. We are more aware of crime and there is a trend towards higher rates of imprisonment, but crime itself is declining. If we consider your thesis, that crime rates and spanking have a causal relationship, we see that as rates of corporal punishment in the home go down, so too do crime rates. A high percentage of prisoners are drug offenders. One hundered years ago many drugs were legal. That’s why there are so many people now in jail. Most who are in jail were spanked. Another stat for you, Laura… 46% of federal prisoners are in for DRUG related crimes. This wasn’t an issue 100 years ago… So, maybe find another angle… And — I don’t have a stat for this, but — I suspect beating a child is not going to keep the adult away from a bottle or pipe. Just a hunch, though. I needed this, so thank you, Janet. To me #4 is the hardest and I am still strugling with it but I will get to the calm point, I will! Beautiful! I stumbled across your blog and was introduced to RIE a few months ago, and even though my children are beyond their baby/toddler years, I keep coming back! Thank you so much for being such a supportive and approachable resource – your words are a breath of fresh air in this hurried world! You are most welcome, Sarah. I’ve been sitting here reading the post over and over, and all the comments and I’m still confused. It all sounds perfectly reasonable and right, but I’m struggling to put any of it in practice with my 18-month-old. He’s obviously a very young toddler, and he tests the boundaries more than my eldest son ever did. I have to admit I do end up losing my patience and raising my voice – when I don’t want to, because I end up feeling very drained. When he scratches, hits, throws heavy things at his brother and at me, I simply say no in a very firm voice. But it doesn’t work. When he refuses to sit down at the table for his meal, I simply say that I’ll bring his food over when he sits down. He doesn’t say a single word yet, but his comprehension is perfect. Every moment of my day is a battle with him, everything from changing his nappy to reading him a story. I have tears in my eyes when I say this, but very often I don’t enjoy his company because it’s just so hard on every level, and it has a massive impact on my eldest son’s behaviour. My approach so far has been to try and ‘get through’ toddlerhood as best as I can. Just survive it. Battle through till we get to a better part. But I get upset, because I’d really like to enjoy him more. 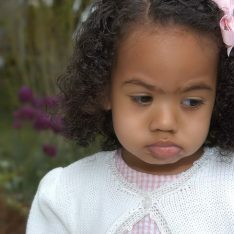 Vanessa, 18 months is a very typical age for children to test boundaries. Perhaps this son is a bit more willful than your eldest. Many, if not most, children need more than “NO in a firm voice”. They need the safety and comfort of knowing that you can calmly and confidently stop them from doing things that upset you. Remember that this is a tiny guy and you are a much bigger adult. We tend to lose this perspective when our children act out, but regaining it is the best way to rise above these situations and see them for what they are. We need to feel strong and in control enough NOT to get mad. Does that make sense? You are the mom…and you can do this! When you rise above this, you will stop engaging in the battles and the battles will cease. When there is hitting or scratching directed at you or one of your sons, calmly hold your baby’s wrists or arms and say, “I can’t let you hit. That hurts.” Then drop it. Don’t get mad, or lecture, just understand. He is not a bad boy, he’s a little guy trying to figure out if there is a calm leader available to him. He can’t grow and flourish without knowing that he’s safe that way. He needs you to know that you can handle whatever he throws at you (literally!). Now, the example you gave about sitting down to eat sounds perfect to me. You ask him to sit when he’s ready to eat and then you will give him his food. That is great boundary setting. What is happening after that? If this isn’t working, then perhaps you aren’t following through… Are you giving in? Or are you trying to force him to sit down because you are worried that he won’t eat otherwise? He will. He’s old enough to understand this rule, but only IF you are consistent. Otherwise, it’s too confusing for him. I feel his way with my toddler sometimes. It’s hard for them too, I think, because they know you feel this way.I think they know they are a pain. There is this older sibling who can do it all and control their emotions and you give them more responsibilities because of their age, and I think it’s very frustrating. Also they will grow into playing the part of the bad kid, because they start out one until they learn the rules. The older kid releshes the good kid role and of course the younger kid couldn’t perfect that role overnight so they are stuck with the role of bad kid. They pick up on these roles and play them out…maybe we project them?. I mostly had the second one because I knew it would be a wonderful thing for my oldest. I didnt have as much patience the second time through toddlerhood. I knew what was missing. If there are problems I think it means they need you to play with them. I think they need more of your time. There is a lack of connection. I was just all used up!! They were only 18 months apart and it was very hard for a while but it was worth it. They play, play play all day now! I still should be putting more play time in there though…it’s after they go to bed that I feel like I should have played more. I’m struggling to improve on the parenting that was passed down to me…but I feel like a kid and that helps….sometimes I just act like a brat mom though! Wow! Amazing article! Great to bave toddler point of view 🙂 Interesting comments… I have no children of my own yet but care for 5 children aged from 9 weeks to 4 years in my home based care setting. Firstly I would not EVER hit a child in my care (my own or otherwise) and secondly it is simply against the law! In 2009 nz government enforced an ‘anti-smacking law’ to help protect children. Under this act carers may still use ‘force’ by way of physically holding a child, physically assisting a resisting child for instance into a carseat or pulling them away from danger i.e. hot stove. I follow the RIE philosophy with the children I can for and constantly revisit Janet’s posts for articles to support my children. I believe that when I have my own children I will never smack/physically punish them. If I show them respect they will respect me, otherwise I’m doing it wrong not them! Thanks again Janet for you broad and supportive articles 🙂 I could read for hours! Hi there, thanks for the wisdom. I have a question. My two year old, who is very strong willed, is normally pretty reasonalble and independant. I don’t like to let her watch too many movies or use electronics but since she has a 6 year old sister, sometimes she gets to watch more than I think is healthy for her developing brain. Recently she has been “stealing” my phone to play games on it and asking for movies A LOT. This morning she woke up from sleeping well and immediately started asking for movies (just one! she said) or games. She literally wouldn’t stop asking for the next 2 hours as I tried to get both kids ready for school. It was very frustrating to say the least. I kept telling her no we are going to do this instead. Over and over. By the end I lost my temper. I’m really not sure what to do, though, in this situation. I can’t stop her. I mostly had to just keep on making breakfast and lunches and talk to her occasionally. I tried reading a few books which quieted her only while I was reading. She refused breakfast and later shanged her movie requests in to a lollipop request which repeated for a half hour. She is not usually like this. What can I do? I’m not sure why some of us have precise early childhood memories and others don’t. I may not recall what I had for breakfast yesterday, but I have vivid memories of my toddler years. They are far more emotion and sensory laden memories than those from later years, when we’re so much more in our brains. For example, I remember hating it when we had company. My mother smelled different and her attention was sparse, even dismissive as she tried to be a gracious hostess while dealing with an anxious child. My feelings spread out into my whole body. I tended to hide, crying when I was scooped up and talked to by guests. I couldn’t respond and my whole being felt like a jangling alarm. I wanted to be in my crib where I felt safe. When finally I was in bed I was reassured by the sound of my parents talking and by the taste of the crib’s wooden top rail. I gently rocked my head against the bars in a comforting rhythm to lull myself to sleep. Remembering childhood helps us to empathize with children. You DO understand toddlers Janet. How fascinating that you can remember that, thanks for sharing! I have 8 children and am still learning how to be a good father. I am one that used to believe in a spank here and there, but now I don’t. I think for men in particular, we try and reason with smaller children. It is also frustrating with what we think is bad behaviour. I have come to realize that it is just stages of life coupled with being tired, hungry, bored etc. I find it very much easier to deal with children 5 and up, where reason and logic begin to appear in a child. If your like me, and get angry easily, just take a deep breathe and think that it is only the age or uncontrollable emotions. Oftimes, ‘misbehaviour’, is a call for love and tenderness. i read a good book, best book I have read on the subject, simple book that really helped me called ‘How to Really Love Your Child’. Also, think of discipline, ie. sparing the rod spoiling your child, as a call for training and spending time with your child- they are like sponges and will learn from you at all times. The rod is the rod of a shepard, it doesn’t hit the sheep it lovingly guides them. You start hitting the sheep it turns into choas, the sheep are upset and won’t follow! And plase don’t let them watch TV, bad on so many levels. All of us with toddlers need to be reminded of this. If you have a toddler, chances are you are suffering from lack of sleep or fatigue and it is hard to have the patience to put these things into practice. But we need to. Thanks. As we come to understand more about the developing brain we can understand with greater clarity why out children respond as they do. It’s all about the brain. The notion of punishment as a way to force someone to do what you want them to do is obsolete. Most of our parenting is unconsciously copying what was done to us. ‘The Whole Brain Child’ by Daniel Siegle is excellent. I feel a need to chime in here. I was spanked as a child precisely 3 times. I had my hand slapped exactly twice. All of the instances were 100% deserved and acceptable in my mind. I was spanked for intentionally trying to hurt my younger sister in what could have been a serious way if I had not gotten very very lucky. In one instance, had luck failed me, I would have undoubtedly killed her. I remember each instance of spanking with vividness & recognize that it was an absolute last resort for my parents. I know they didn’t enjoy it. I know they didn’t want to resort to such measures. I know I was not, under any circumstances, abused by my parents. I also remember that I never repeated the behavior again once the spanking had been administered. My hand was slapped twice, hard-in a way I remember to this day-because I had a dangerous fascination with heat and flame and fire at a very young age. Red & orange were my favorite colors & fire was just so beautiful & interesting. It even danced! His could that be dangerous. I was watching my mother cook one day and when she turned to get something, I walked up behind her and reached up to play with the flame on the gas burner of our stove. She turned back and slapped my hand to stop me from seriously injuring myself. This happened once more at a camp fire while toasting marshmallows when I tried to place a flaming mallow in my mouth. These are necessary instances in my mind of severe punishment. Of using an absolute last resort. I simply can not agree that this generation of child coddling parenting works. Children get more & more out of hand. They are prescribed more behavior controlling drugs every year. They are, in many cases, ruling their parent’s lives-and this should not be the case. More does it have to be. Sometimes, unfortunately, some level of force is necessary. Some level of fear is a good thing. You can not always be your child’s friend-you must be an parent first. As I read through the comments, I see a lot of mention of spanking and prison. However, from what I have read, much of this data has been mis-applied. Just because many prisoners (who may be in there just for marijuana possession) were spanked does NOT mean the reverse– that many spanked will end up in prison. There are other spurious relationships to consider as well. Perhaps it is something as simple as “Low-income families tend to spank more. People of low-income go to prison more often”. The causal relationship may be being low-income… not from spanking. I tell you this not because I am trying to advocate spanking. However, I feel that you are discrediting yourself when you don’t appropriately apply statistically data…. and it is too important of a subject to muddy one’s reputation. Correctly interpreting statistics is severely lacking in the U.S.– you have plenty of good company in it! Again, thanks for the good read! This is a fantastic article! I have a query though, about the best approach to a situation that keeps occurring. We have a little friend who keeps pushing our daughter ( they are both almost 2 and a half years old) and although her mum calmly and consistently tells her she cannot do it (and takes her into her lap to talk to her about it), it keeps happening. Unfortunately at times my daughter has been hurt. As per your article, my friend seems to be doing all the right things (not getting emotional or making too big a deal of it) but I’m wondering what exactly it would look like to be ‘convincing enough’ with boundaries in this situation? Usually, my friend holds her daughter for a minute or so and her little girl seems to understand that she shouldn’t push but then she does it again soon after. Any specific advice would be gratefully received! I have an 8 year old and we have a difficult time with discipline with him. He is an angel for other people but lashes out with us, his sister and his Grandparents. I find alot of you articles relate to his issues but should the solutions offered work beings he is not a toddler? Mostly, yes! Children don’t want to be “that guy” and are requesting our help when they act out. By lashing out, do you mean verbally or physically? I have been temporary living with my in-laws and having the worst time of my life. I have a 2 years old well behaved, very calm daughter. I have lived with my in-laws in the past when I didn’t have my daughter. My brother in law has a daughter. She is 4 and I fell in love with her when she was born. I have played a major role in helping my BIL and his wife with their daughter. I moved in with my husband in another state 6 months after my daughter was born. We are expecting our second child and my husband has to live abroad for few months due to his work commitments. Thus I moved in with my in-laws. Now that my daughter is two and my brother in law’s daughter is 4, he is feeling threatened by my daughter. His behavior towards my daughter is so negative it is just heartbreaking. His 4 year old didn’t like the idea of another girl coming in the house since she was the princess. She started off very negative with my daughter but later on tried to adjust. They liked to play together but the 4 years old doesn’t like sharing. My daughter would push her back “not hit her” when she wouldn’t share. This would become a huge scene in the house. He would start scolding my daughter and telling her she is a bad girl and that she would not get any toys. He expected me to give my daughter a timeout (which I didn’t). For God’s sake she is 2 and doesn’t even know the concept of a timeout. It is hurting me the most because my child doesn’t deserve to be treated like that. He has not even thought for once how I treated his daughter. I am losing faith in humanity and am very stressed. His wife is very ashamed of his behavior. I apologize for a long message but I just needed to vent. Janet, can I just say a big thank you for your work and for generously sharing your knowledge and insights. I have a 4yo and 18mo and I only started reading your articles recently. I printed this one out as it really resonated with me. I’ve always been a gentle and respectful parent but also somewhat prone to mummy meltdowns to various degrees. It’s as if reading this flicked a switch in my brain and I’m now able to stay calm, confident and in-control. Even over the last couple of weeks when I’ve been more tired than usual (we’re working on some sleep issues and I’m finding it a bit draining despite our youngest now sleeping much better) I’ve been able to recognise when I might get too easily frustrated, explain it to my 4yo and set boundaries so I won’t lose control (eg. ‘no, I’m sorry I can’t be a pirate while I make lunch today, I just need to concentrate on one thing a time’). I feel that in the past I’ve blamed her too much for my undoing. So again, thank you! I am warmly recommending your work to others. 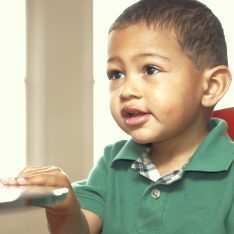 A few comments here have me shaking my head – why do some people equate spanking with “being a parent” and if you don’t, you are only trying to be your “child’s friend”. What a narrow limited view of parenting! If physical punishment is the only tool in your tool box for discipline then you must expand your parenting skills. Aside from it being harmful and sad to use physical power over your child as punishment or to get what you want from them (and what happens to your relationship with them when you cannot physically overpower them anymore? And what are you teaching them about relationships in general?) it is a small minded, in the moment way of a parent getting what they want. Being a parent feels like to me first and foremost being my child’s teacher and guide. What in the world are you teaching your child about being a human being if your only solution to getting what you want as a parent is to spank? You are giving them no skills and as a parent I feel it’s my job to help my child develop their skills so that they can lead a happy, satisfying life. And I will tell you what you teach them with spanking – you teach them fear. And one day they will need to call upon their skills with another person or perhaps even their own child when they are in conflict and the only tool you have given them was fear. You can do better. We all can. Let’s pass on better skills than that. I have found this way of discipline to work well with my almost 3 year old except in one situation. And I know it is because I cannot stay calm. When he gets frustrated/over tired/ overwhelmed etc he has a habit of ripping off my glasses. He has already broken a pair. I have tried everything that has been discussed but when he does it I have a hard time staying calm about it. My little boy is always pushing. He went through a period from about 13 months to 18months. Then started crèche and pushing stopped. Now at 23 months the pushing has started again. He is a heavy and strong boy so when he pushes it’s really horrible for the other child. I am trying to be calm and not overreact but feel I must be doing something wrong, I know sometimes I do probably stress. Do you have any tips on how to stay calm and not react at all?